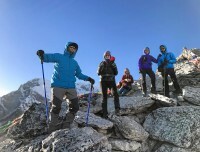 On world highest Mt. Everest with sweeping panorama of Khumbu ice falls and glaciers. Explorer Adventure offers Everest Base Camp Trekking, with enough time to enjoy its magnificent surrounding of worlds highest peaks with Mt. Everest and majestic Mt. 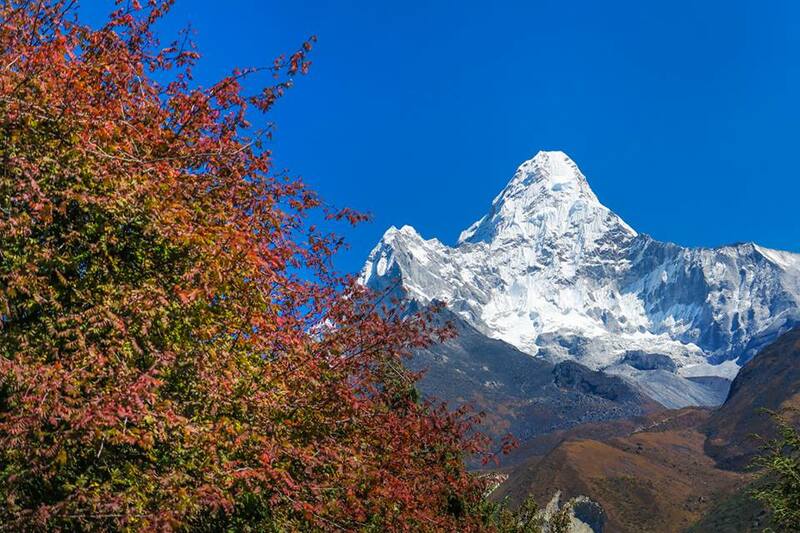 Ama Dablam in the harmony of local Sherpa villages enriched with age-old cultures and colorful heritage of Buddhism religion. An adventure which certainly delights you from the start to an end where walks leads you on serene trails with constant views of giant mountains and rolling high green hills covered with lovely cool alpine forest of rhododendron-birch-pines-oaks-magnolia and fir trees. 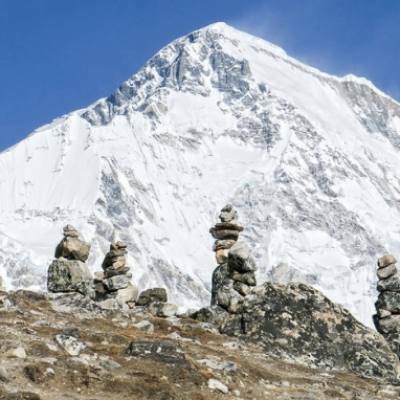 Everest Base Camp trekking leads you from lush vegetation to arid and windswept country as walk progress to reach higher altitude where we will have ample time with rest days for acclimatization before heading higher terrain. 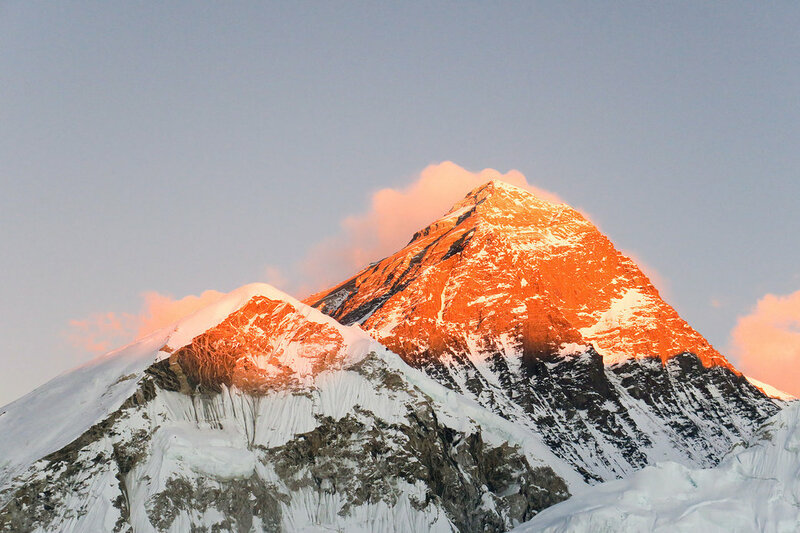 We have designed Everest Base Camp Trekking for you to enjoy with enough days to marvel the beauty of marvelous scenery and soak in local cultures of Sherpa the highlanders of Everest, famous as leading and pioneering guides around Himalayan mountains since 1953 till present. Everest Base Camp taking starts with scenic flight to reach at Lukla from the capital Kathmandu, and then walking past impressive villages and monasteries within green woodland to reach higher elevation with time at famous Namche Bazaar-Thyangboche monastery and at Dingboche within beautiful Imjatse valley. After having an exciting time at Everest Base Camp our return walk leads with climb to highest point of the adventure on top Kalapatthar located above 5,545 m high offering breath-taking panorama of mountains with close views of Mt. Everest at near distance. 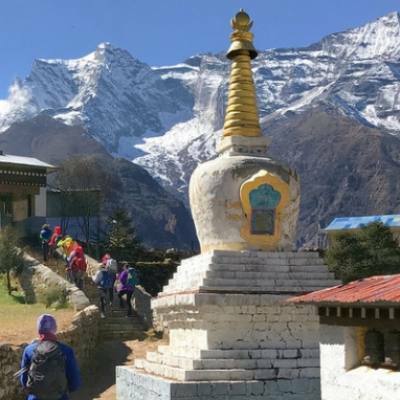 Finally ending our marvelous adventure around high Khumbu at Lukla, where scenic sweeping flight brings you back at Kathmandu with everlasting memories and adventure of a lifetime on Everest Base Camp trekking. 1 Day 1: Arrival in Kathmandu and transfer to hotels.On reaching Kathmandu Tribhuwan International Airport where you will be warmly received by our guide and staff and then transfer you to your respective hotels in the hub of Kathmandu city. First check into your hotel rooms on getting refreshed from the flight and with Jet-Lag, then join with other members of Everest Base Camp trekking for group briefing, where our expert guides will inform regarding your stay in Nepal, hotels, trekking, local lodge and overland drives with do’s and don’ts information, evening welcome group dinner in authentic Nepalese restaurants with Folk cultural programs to entertain you during your meals. 2 Day 2: In Kathmandu with sightseeing tour around world heritage sites.Morning after breakfast leave the hotel for exciting guided sightseeing around Kathmandu where our city guide will lead you to places of interest, Kathmandu a metropolitan city still retains its ancient heritage and varied ancient culture where you will visit world heritage sites around Kathmandu for half day or full day. After an interesting and wonderful tour of ancient historical and religious sites around Kathmandu, with afternoon free preparation for next day flight to Lukla for Everest base camp trek. 7 Day 7: Trek to Dingboche 4,320 m - 05hrs.Morning catching super views of high peaks with Everest, our route descends into forested areas reaching a metal bridge, from here a slow climb encountering mani (prayer) walls along the walks to Pangboche village, this is a last Sherpa permanent village on route to Everest base camp. From here walk leads on barren and arid country where tree lines drops for small bushes of juniper and dwarf rhododendron (azalea). 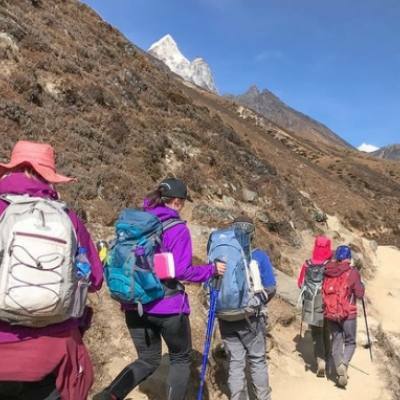 Walk leads uphill into a river gorge and then finally opens up into a wide glacial valley on reaching Dingboche with many good lodges around facing views of Imjatse or Island peaks towards east. 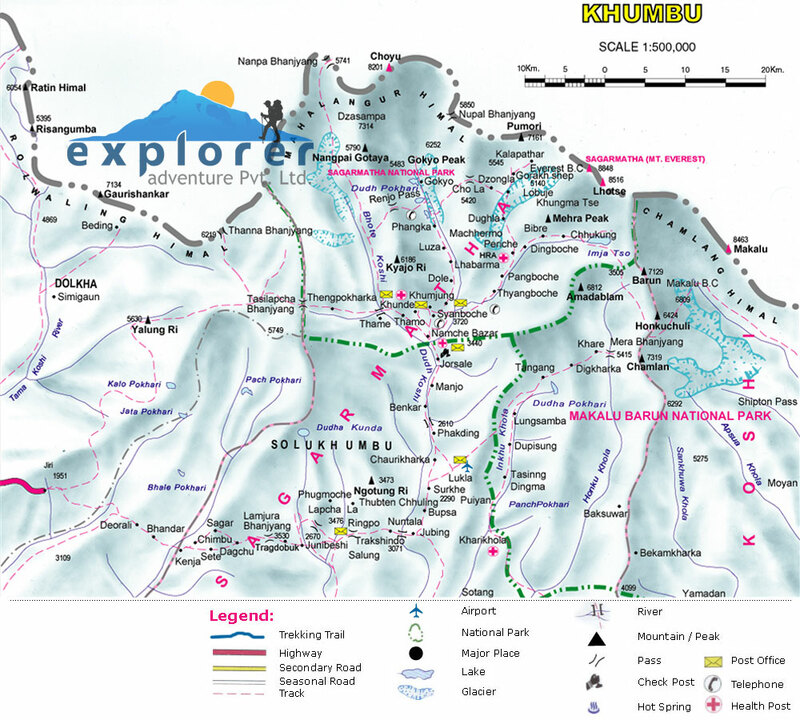 8 Day 8: Rest day at Dingboche for acclimatization and excursion.Another good rest day for acclimatization as elevation gets higher, Dingboche a fine place for leisure hike and walks around where a climb up to a hill offers tremendous scenery of peaks with Mt. Makalu towards east horizon. 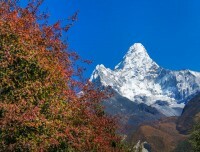 Enjoying scenic excursion with afternoon free to catch up with your dairy and relax marveling the views of Amadablam North Face with other giant mountains. 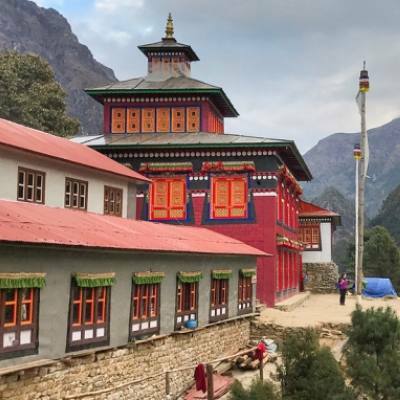 9 Day 9: Trek to Lobuche 4,930 m - 05 hrs.From Dingboche walk climbs to a ridge marked with prayer flags and Stupas, then walking on nice gradual uphill facing marvelous scenery to reach at a small place in Thugla where Khumbu glaciers melts into a torrential river. 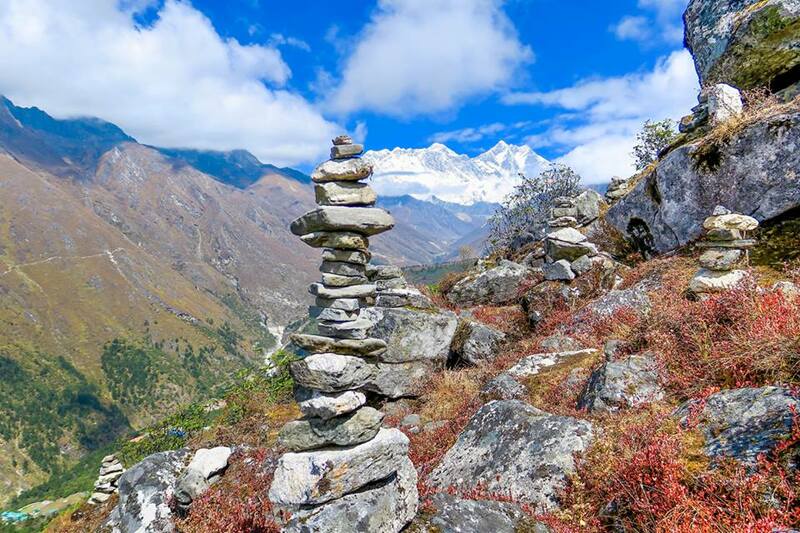 A perfect place for rest and lunch stop, where afternoon walks leads to a steep climb at Thugla hill a place with memorials of unfortunate climbers who died on climbs around mountains of Khumbu and Everest. Walk continues for another few hours on nice gradual up to Lobuche for overnight stop, a place with several nice lodges with views of Nuptse and Lobuche peaks. 10 Day 10: Trek to Everest Base Camp 5,364 m and back to Gorakshep 5,180 m - 06 hrs.Today a great walk towards our main highlight and final destinations to reach Everest Base Camp, as morning walk leads on open wide valley with slow climb to reach above Khumbu glaciers, walking past moraine dunes reaching at Gorakshep, a place with few lodges on the junction of Everest base camp and Kalapatthar route. Gorakshep was a base camp of Everest expeditions in early 1950’s to late 1970’s before the route was made further away to present base camp. 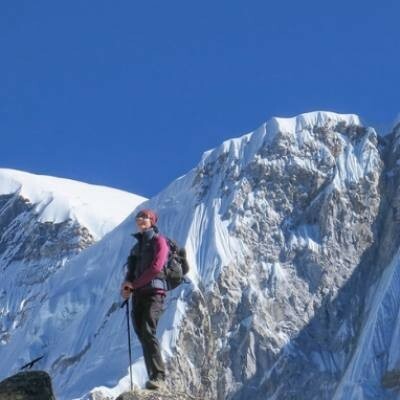 From Gorakshep few hours walk over moraine and glacier to reach our ultimate destination at base camp with sweeping views of giant peaks of Nuptse-Lo la, Nuptse with notorious huge Khumbu Ice Falls and glaciers. In high mountaineering season this place will be active with climbers and crews with many camps set on top of moraine and glaciers. After a grand time then head back to Gorakshep for highest overnight stop of the adventure with fantastic memories of the day walks to Everest base camp. 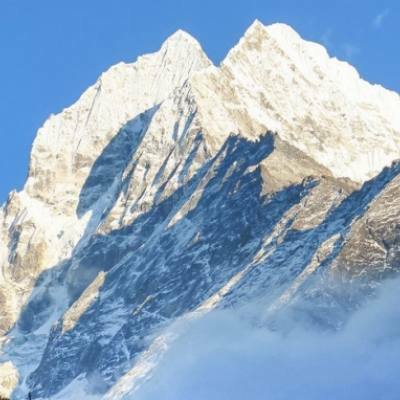 11 Day 11: Morning hike to Kalapatthar 5,545 m descend to Pangboche 3,900 m - 06 hrs.Morning climb to Kalapatthar above 5,545 m, the highest point of the trek offering incredible panorama of mountains with Everest at stone throw distance. With amazing time on top head back to Gorakshep for breakfast and continue trek downhill past Lobuche and Thugla, where walk leads to windy Pheriche valley with many good lodges with time for lunch break at Pheriche. After Pheriche walk leads down with short climb and then a long descend to reach our overnight stop at Pangboche village with unique views of Ama Dablam at close distance. 12 Day 12: Trek to Kyanjinma 3,645 m on route Namche - 06 hrs.From Pangboche morning walk downhill to cross a bridge over Imjatse Rive and then an hour climb to Thyangboche Monastery within green vegetation and tree lines, with time here to relax and enjoy the scenic views, and then head downhill to Phunki Tenga with climb for an hour to reach a small place at Kyanjinma for overnight stop, which is on route to Namche, a pleasant peaceful spot facing views of Everest-Ama Dablam and Tharmasarku with other range of peaks. Here chances of spotting some wild-life like musk deer, herd of Himalayan Thar and pheasant Danfe (national bird of Nepal). 13 Day 13: Trek to Monjo 2,860 m via Namche Bazaar - 05 hrs.After a pleasant morning with super views of Everest and adjoining peaks, a nice walk leads you at Namche with time for lunch break and stroll around its bazaar with stores and shops, afternoon walk downhill to Dudh Kosi River to reach at Monjo village for overnight stop before Lukla. 14 Day 14: Trek to Lukla - 04 hrs with afternoon at leisure.Our last walk of the adventure a short trek of few hours following on the same trail back to Lukla past Phakding and Ghat villages crossing few times over Dudh Kosi, with last final climb to reach Lukla town For last overnight stop around high scenic Khumbu and Everest region. 15 Day 15: Fly to Kathmandu and then transfer to your hotels.Morning transfer to Lukla Tenzing and Hillary airport for sweeping short flight to Kathmandu facing scenic views of mountains, green scenery of hills and farm fields with nice villages and towns as flight lands at Kathmandu airport and then back to your hotel, with free afternoon to relax of great memorable adventure on Everest Base Camp Trekking. 16 Day 16: In Kathmandu spare and contingency day with optional tour.A free day in Kathmandu reserved as contingency in case of flight delay and cancellation at Lukla, which can occur sometimes as Himalayan weather pattern can be unpredictable with bad unfavorable day for flights. Just to be in the safe side if all goes perfect as per the itinerary days, one can enjoy the rest day for individual activities and relaxing or join in for another exciting sightseeing tour around Kathmandu-Patan or Bhaktapur. 17 Day 17: Depart for international flight home ward bound or to respective countries.Your last memorable day in Nepal after a wonderful experience on Everest Base Camp trekking with great service of Explorer Adventure, and as per your international flight then transfer to Kathmandu international airport for homeward bound or to your respective destinations. Even now after 2 years I'm still feeling great warmth and I'm so thankful to you, Bam Magar, and your nephew Uttam for being our guides on this steep track to Everest Base camp! You've made this not the easiest journey safe, comfortable and very exciting. Thank you for being so warning and knowledgeable. And indeed thank you for your stories that made Nepal the country I will definitely love to visit some day again!